Two weeks after Donald Trump's shocking upset of Hillary Clinton, the imperious and imperial neoconservatives and their liberal-interventionist understudies may finally be losing their tight grip on U.S. foreign policy. The latest sign was Trump's invitation for a meeting with Rep. Tulsi Gabbard, D-Hawaii, on Monday. The mainstream media commentary has almost completely missed the potential significance of this start-of-the-work-week meeting, suggesting that Trump is attracted to Gabbard's tough words on "radical Islamic terrorism." 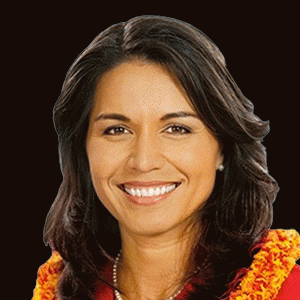 Far more important is that Gabbard, a 35-year-old Iraq War veteran, endorsed Sen. Bernie Sanders in the Democratic primaries because of his opposition to neocon/liberal-hawk military adventures. She starred in one of the strongest political ads of the campaign, a message to Hawaiians, called "The Cost of War." "Bernie Sanders voted against the Iraq War," Gabbard says. "He understands the cost of war, that that cost is continued when our veterans come home. Bernie Sanders will defend our country and take the trillions of dollars that are spent on these interventionist, regime change, unnecessary wars and invest it here at home." In the ad, Gabbard threw down the gauntlet to the neocons and their liberal-hawk sidekicks, by accusing them of wasting trillions of dollars "on these interventionist, regime change, unnecessary wars." Her comments mesh closely with Trump's own perspective. So, the surprise election results on Nov. 8 may have represented a "trading places" moment for the neocons and liberal hawks who were eagerly counting the days before the "weak" President Barack Obama would turn over the Commander-in-Chief job to former Secretary of State Clinton who had made clear that she shared their hawkish agenda of escalating the war in Syria and ratcheting up the New Cold War with Russia. There was even speculation that one of Clinton's neocon favorites within the State Department, Assistant Secretary of State for European Affairs Victoria Nuland, might be rewarded with State's top job for her "regime change" in Ukraine that sparked the start of the New Cold War in 2014. Nuland, the wife of arch-neocon Robert Kagan, sabotaged President Obama's emerging strategy of collaborating with Russian President Vladimir Putin on sensitive global issues. In 2013-14, Putin helped orchestrate two of Obama's brightest foreign policy successes: Syria's surrender of its chemical weapons arsenal and Iran's guarantee that it would not develop nuclear weapons. But those agreements infuriated the neocons who favored escalating both crises into direct U.S. bombing campaigns aimed at Syria and Iran -- in accordance with the desires of Israeli Prime Minister Benjamin Netanyahu and the Saudi monarchy. Yet, there was perhaps even greater alarm at what the next move of the Obama-Putin tag team might be: demanding that Israel finally get serious about a peace deal with the Palestinians. So, the neocons took aim at Ukraine, which neocon National Endowment for Democracy President Carl Gershman identified as "the biggest prize" and an important stepping stone to an even bigger prize, a "regime change" in Moscow removing Putin. While Gershman's NED funded (with U.S. taxpayers' money) scores of projects inside Ukraine, training anti-government activists and journalists, Nuland took the point as the key organizer of a putsch that removed elected President Viktor Yanukovych on Feb. 22, 2014, and replaced him with a fiercely anti-Russian regime. Given the geopolitical sensitivity of Ukraine to Russia, including its naval base on the Crimean peninsula, Putin had little choice but to react, supporting a referendum in Crimea in which 96 percent of the voters favored leaving Ukraine and rejoining Russia -- and assisting ethnic Russian rebels in the east who resisted the violent ouster of their president. Of course, the mainstream Western news media presented these developments as simply a case of "Russian aggression" and a "Russian invasion." And, faced with this new "group think," Obama quickly abandoned his partner, Putin, and joined in the chorus of condemnations.